Thanks to Dr. Jaya Bajaj, Dr. Kasturi Das and Dr. Cecilia Gimenez, North Shore-LIJ Health System, New York (USA), for contributing this case and part of the discussion. To contribute a Case of the Week, follow the guidelines on our Case of the Week page. Shop Amazon.com! Win a $100, $50 or $25 Amazon Gift Card! To promote shopping at Amazon.com, particularly by going through our website, we will award Amazon gift cards of $100, $50 and $25 through a drawing of those who made purchases at Amazon.com in May or June 2015. Enter now! Only 4 contest entries as of 27 May 2015. For this quarter, there were 113 job postings for full time or part time pathologists at PathologyOutlines.com, which form the basis for the statistics below. This is a 94.8% increase from the 58 job postings in the first quarter of 2014. We have excluded postings that were only for locum, PhD, residency, fellowship or non-Pathologist positions. Of the 113 postings, 105 were for 1 position, 3 were for 2 positions, 2 were for 3 positions, and 3 were for an unspecified number of positions greater than one. (2) How are you supporting us? Click here to find out your various options on how to contribute! (3) Our Feature page for May is Computer Software and Systems, and highlights our advertisers PathView Systems and Physicians Independent Management Services (PIMS). It also contains an original short article, "Computer-Assisted Diagnostics: A New Tool for the Pathologist ", by Jaleh Mansouri, M.D. (4) Visit our Updates page to see recent updates to the textbook including 3 topics with new images and 8 new topic reviews. 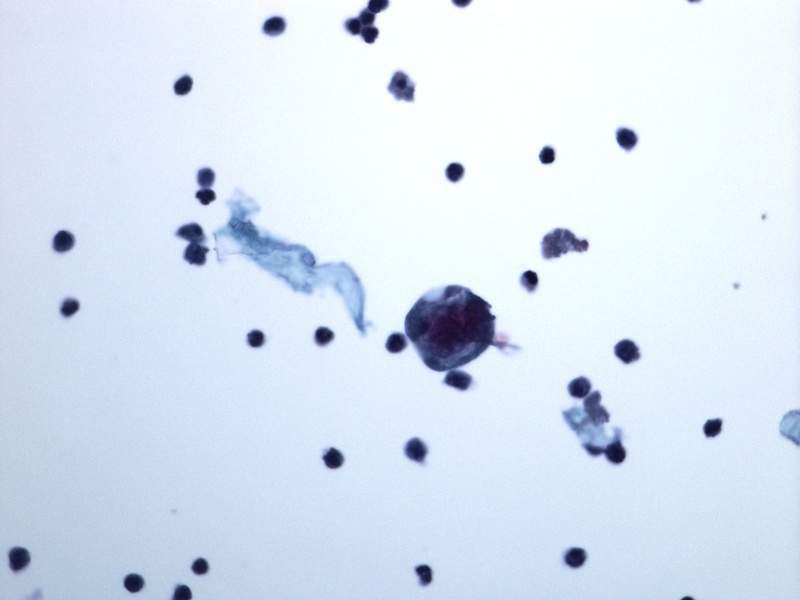 A 47 year old man presented with malaise, fatigue and history of recent urinary tract infection. 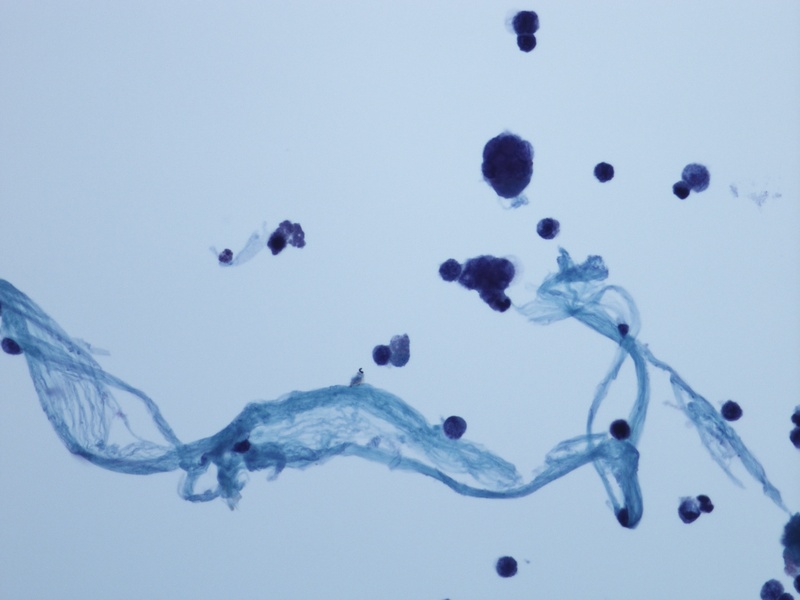 A urine specimen was submitted for cytologic examination. The case was reported as "negative for malignant cells; cellular changes compatible with herpes simplex virus noted". There was no clinical suspicion of HSV. Viral infections of the bladder are usually seen in the immunocompromised setting, and include herpes simplex virus (HSV), cytomegalovirus, polyomavirus and HPV. They may be hemorrhagic. 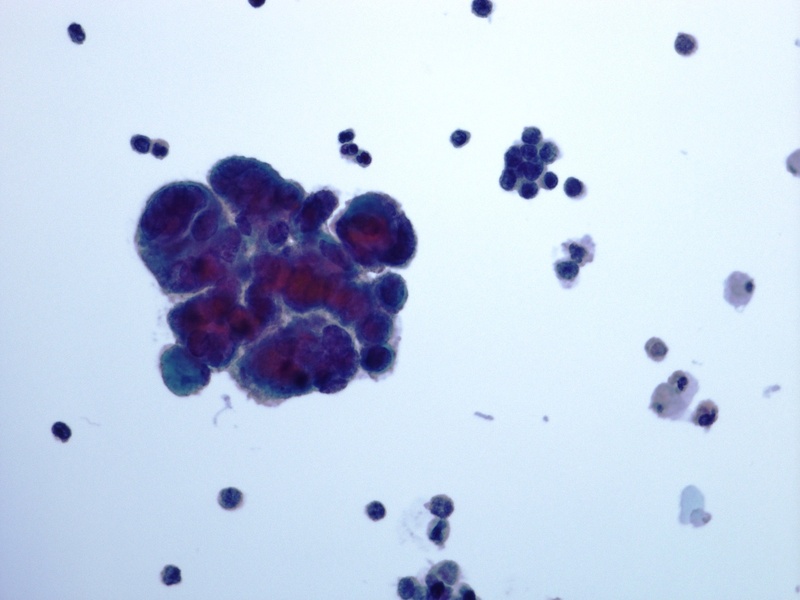 Herpetic cytopathic changes include multinucleation, nuclear molding, margination of chromatin and ground glass chromatin texture. 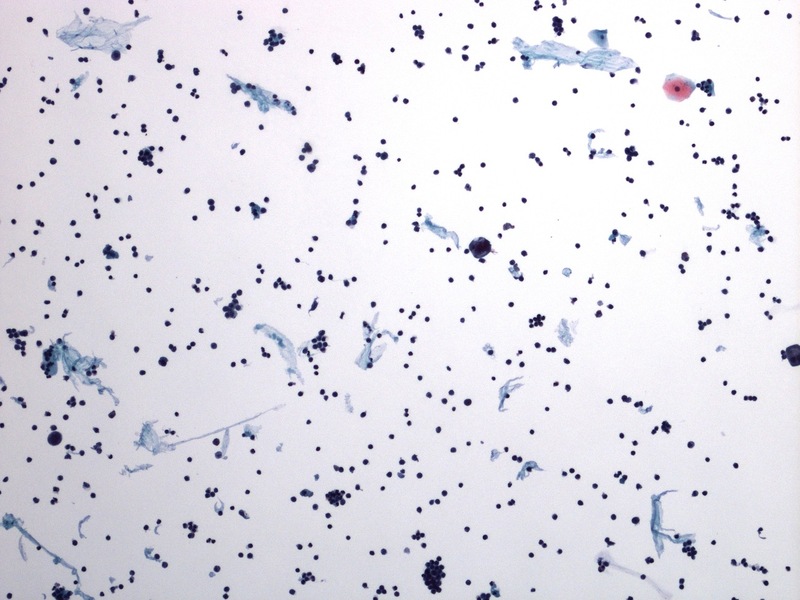 Large, sharply angulated, eosinophilic nuclear inclusions may also be present, as in this case. Infected cells can be greatly enlarged and bizarrely shaped, with dense, opaque cytoplasm.